'Signorina' ( Marky Smith, R. 2010) Seedling #03-12V. BB, 22" (56 cm), Midseason bloom. Standards smoked heliotrope-lilac (RHS 88C) paling to tan peach edge, peach coloring wider at base; style arms tan peach, mauve smoky tinge to midribs and crests; falls almost completely washed russian violet (79B) subtle veins radiating outward from cream area around beard, shoulders blended smoky salmon, narrow cream-salmon edge, 3/4" cream spear below beard, short salmon veins around heart; beards vermillion (44), cream base tipped vermillion at end; ruffled, luminata pattern; pronounced spicy fragrance. 'Low Spirits' X seedling #00-26H: ( 'Owyhee Desert' x 'Flights Of Fancy'). Salmon Creek 2017. 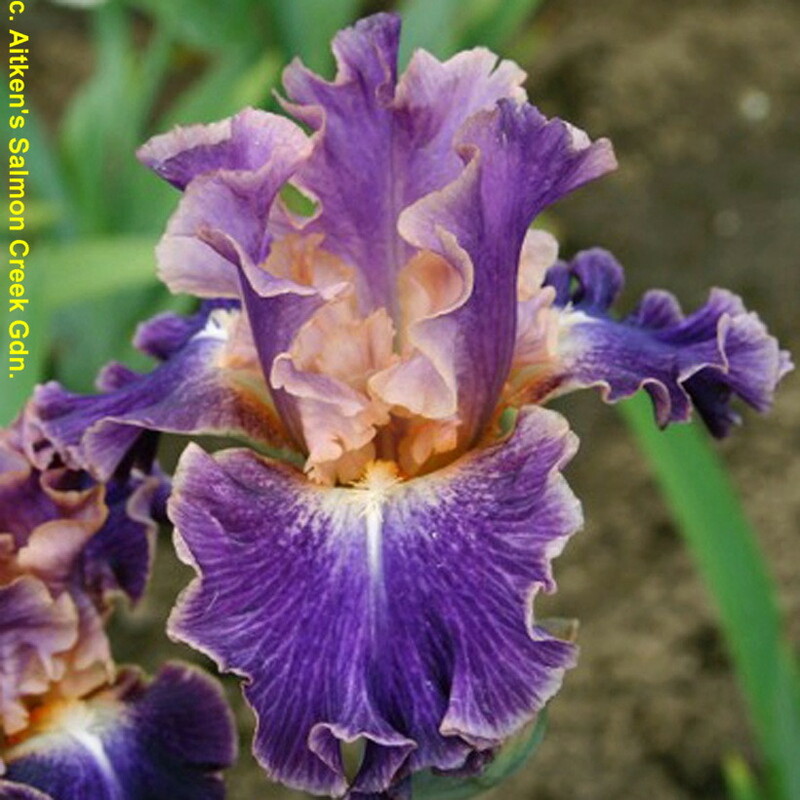 From Aitken’s catalog, 2017: SIGNORINA (BB) (M. Smith '17) BB 22” (56 cm) M. Grayed lilac standard edges are tan-peach, wider at the base. Styles are tan/peach with smoky mauve tint on midrib and style crests. Falls have a cream area beside beard, becoming smoky salmon toward fall shoulders; narrow cream-salmon fall edge. Falls are almost completely washed Russian violet with subtle veining radiating from the beard. Cream spear extends ¾ " inch below the beard with a few short salmon veins around the heart. Cream beards tipped vermilion, with solid vermilion in throat. Ruffled luminata with a pronounced spicy fragrance. Sdlg. # 03-12 V : (Low Spirits X 00-26 H: (Owyhee Desert x Flights of Fancy)). SKU: 17BB118. $25.00.